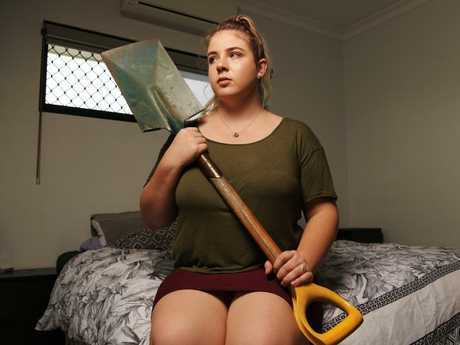 A NINETEEN-year-old woman was forced to lock herself in her bedroom for 20 terrifying minutes while armed youths taunted her as they ransacked her home before stealing the keys to her husband's car and taking off in the vehicle. Ebony Sloan said she'd been left traumatised by the attack on her Muirhead home last Friday, while her husband was interstate for work. "It was the scariest thing I have ever had to go through," she said. "I just remember standing there thinking 'this is it', I'm going to get hurt during this. I was just shaking. My entire body was so weak and felt so belittled that I couldn't do anything. I was so helpless." The four youths broke into Ms Sloan's home just after 1am last Friday, using a knife to cut away a fly screen before pulling a security door off its rollers. She said the intruders startled her dogs who started barking. Realising she was in a dire predicament she called triple-0. "The operator on the phone told me to stay in my room, to lock the door and to hold it shut and she said to stay on the phone, that police were on the way," she said. For the next 20 minutes Ms Sloan remained locked in her room as the youths fleeced her house stealing cash, jewellery and credit cards before taking off in her partner's $60,000 V8 Commodore. She said she could hear the teenagers laughing at her fear as she begged them not to take her partner's car. "I was like 'take my car, take the other car just leave the one precious car'. I then heard them laughing and they thought it was extremely funny that obviously I was that petrified that all this was happening," she said. "They then started up the car and I was just screaming, crying, I was such an emotional mess and the woman on the phone was just trying to calm me down, but it was so hard to try and stay calm during that and I felt like it was just going on for ages." Detective Senior Sergeant Rob Jordan from Strike Force Trident said the thieves drove the car to the United service station in Vanderlin Drive, Casuarina, where they stole petrol before heading towards the city. After a brief pursuit police used road spikes to slow the car down on the Stuart Highway in Winnellie, before the vehicle was abandoned in The Narrows. Three of the offenders fled on foot but a 14-year-old boy was found hiding in a yard. He was arrested and taken to the Darwin Watch house and is now undertaking youth diversion. Ms Sloan praised the police for keeping her calm during the terrifying ordeal and for their support since the incident. But she said she'd been left frustrated after learning the offender who was caught was given youth diversion and had refuse to participate in victims' conferencing. "Unfortunately the young person doesn't want to apologise for their actions so I guess that was also quite hard for us because we don't even get that apology," she said. "We wanted to get to see them and have them apologise for their actions and have them speak to us about why they did it, and get a little bit of closure as well." Ms Sloan said she feared the thieves would return and was now sleeping with a shovel next to her bed. "Now I find myself not being able to sleep at night. I hear a tiny little noise and I'm awake, I constantly am having nightmares and the only time I do fall asleep I'm having nightmares and I wake up and I'm dripping in sweat. It's horrible," she said. She said a neighbour was also robbed recently with thieves walking into her home and stealing keys car keys from the kitchen bench while she was watching television, before taking off with her car. Det Sen-Sgt Jordan confirmed there had been a spate of incidents in Muirhead over a couple of nights earlier this month and police were investigating if the same offenders were involved. "One of the things we have noticed is these kids are targeting unlocked doors and easy access so we are trying to remind members of the public that these kids will target places that aren't secure," he said. Det Sen-Sgt Jordan said police had been in regular contact with Ms Sloan since the incident and were providing welfare support services. "Any unlawful entry is traumatic for anybody involved," he said. "Even when you wake up knowing somebody has been running through your house when you are asleep you have got to feel violated."